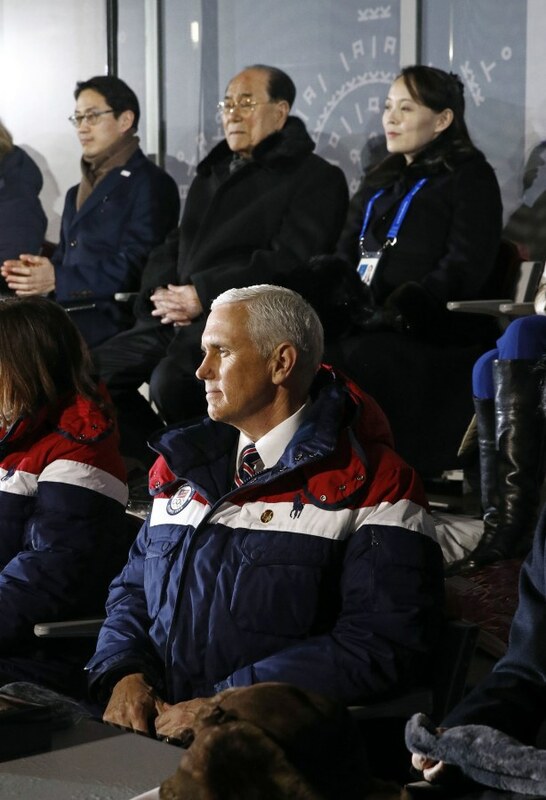 Speaking with NBC’s Lester Holt on the sidelines of the 23rd Olympic Winter Games, in PyeongChang, South Korea, Pence, who is leading the U.S. delegation there, made clear that the U.S. was not ruling out military options as tensions continued to roil the Korean Peninsula. “President Trump and, and our allies in the region have agreed to delay our, our military exercises until after the Olympics. And, you know, President Moon, has appreciated that,” he added, referring to South Korean leader Moon Jae-in. “But we’re gonna make it crystal clear that our military, the Japanese self-defense forces, our allies here in South Korea, all of our allies across the region, are, are fully prepared to defend our nations and to take what is — action is necessary to defend our homeland,” Pence said. North Korea ramped up its nuclear and missile programs last year, testing its first three intercontinental ballistic missiles and most powerful nuclear weapon to date. This was met with international sanctions as well as a flurry of insults between President Donald Trump and North Korean state media. Pence also addressed the White House’s handling of former staff secretary Rob Porter, saying he was “appalled” when he first learned of the allegations against Porter, who resigned after his two ex-wives went public with accusations of physical and verbal domestic abuse. “There’s no tolerance in this White House, and no place in America for domestic abuse,” Pence said. After Pence sat down with NBC News, Trump spoke favorably of Porter at the White House Friday. “When I return to Washington, D.C., I’m going to look into the matter and I’ll share my counsel with the president directly,” Pence said. Meanwhile, the vice president’s tough talk on the North stands in stark contrast to the most recent approach by South Korea, whose high-level discussions with its neighbor last month resulted in the two nations agreeing to participate together in the Winter Games. North and South Korean athletes even marched together during the opening ceremony in PyeongChang, just 50 miles from the North Korean border. And despite the ongoing tension between the U.S. and North Korea, Pence could very well bump into members of the North Korean delegation — led by Kim Yo Jong, the sister of authoritarian leader Kim Jong Un, and his ceremonial head of state, Kim Yong Nam — at the games. 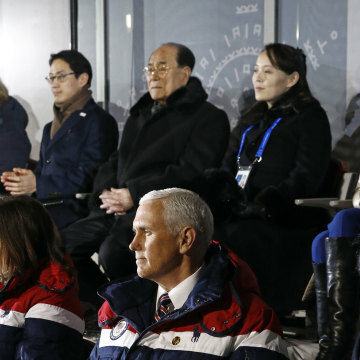 Pictures from Friday’s opening ceremony, in fact, showed Pence and his wife, Karen, seated adjacent to South Korea’s President Moon Jae-in and only one row in front of Kim Yo Jong. North Korea also sent athletes and cheerleaders as part of its 550-member delegation. “But make no mistake about it. The United States of America has viable military options to deal with a nuclear threat from North Korea,” he said.